PrimalxConvoy and O.Supreme also shared this news with us. The project will take the form of a single story manga, but with 6 artists providing 6 different covers to reference the American comics where single issues will sometimes have multiple covers to choose from. The tweet was from twitter account for [url=https://villagebooks.net/mztf_news/]VillageBooks.Net[\url], who are stocking the crossover manga. Note the following tweet and website description are translated using Google so take information lightly till a better translated source becomes available. 【Special issue! 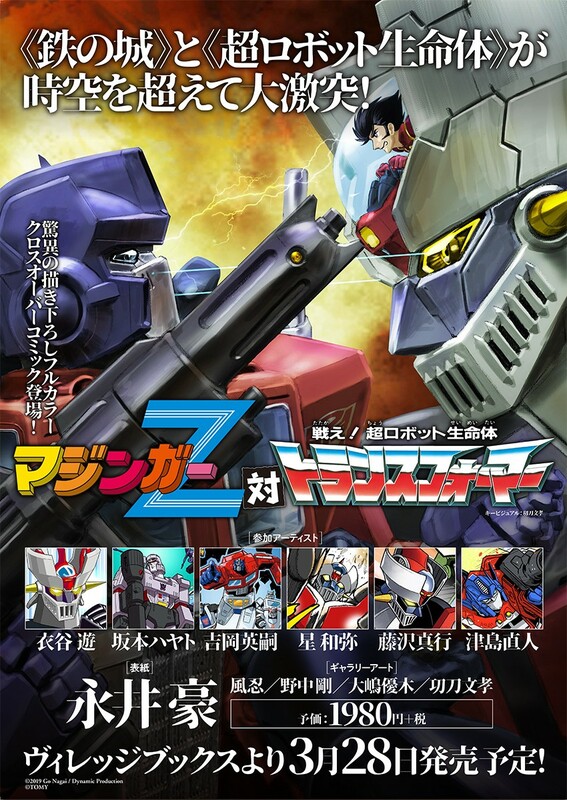 】 Drawing amazing full color crossover comic "Mazinger Z vs. Transformers" Decided to be released on March 22, 2019! The two big robot hero gets a big crash past the spacetime! Dream confrontation realized with a series of six popular cartoonists! Drawing down cover by Professor Nagai! Decided to release on March 28, 2019! "Iron castle" and "Super robot life form" collide heavily beyond the spacetime! Magejger Z who leads Machine Beast Army and fights against Dr. Hell's ambition to contemplate world conquest! Evil Transformers, Cybertron of Justice Challenging Destron! A miracle crossover of world famous two big robot hero finally realized! go beyond the framework of the work and crash in the magazine! In addition to the style of B5 size / full color, we adopted the American comics system where one story is repeated by six artists! Cybertron and Destron both men sucked into space-time distortion appear in Japan where Mazinger Z is active beyond dimension. The battle of the four bombs that brought Dr. Hell and Ashura Baron here was cut off and dropped! For fans unaware, Mazinger Z was created by legendary Manga Artist and storyteller, Go Nagai, he created the characters back in 1972, with an anime version debuting in the December of that year. The show was then succeeded by Great Mazinger in 1974, and then later by UFO Robot Grendizer. Mazinger has enjoyed massive popularity, in Japan and worldwide. Mazinger was also shown briefly under the name Tranzor Z in 1985. Recently Mazinger returned for an all new movie called Mazinger Infinity, which had a limited stateside theatre release. What do you think about this crossover? What other Super Robot series do you think would work well with Transformers? Let us know in the Energon Pub and stay tuned to Seibertron for all the latest news and reviews! This is begging to be news'd. Thanks for the referrence . Yes ever since seeing Tranzor Z myself as a kid (along with of course Transformers, Voltron Robotech etc...) I have been just as big a fan of Super Robots as I am of Transformers. This is a crossover I never thought would happen, can't wait to get this amazing comic. I missed this in the theater, but will definitely be picking up the BRD. Also, this is my pesonal favorite Mazinger series/opening, though the classic and first one for Z Mazinger are pretty epic as well. In any case, I can't wait to see how these two universes collide! Yeah I get it. I got "V" on a good deal, but decided to skip X since the roster didn't impress me (although Mazinkaiser is my favorite, that alone wasn't enough to sway me).... I may wait and see if i can get T for a good deal as well, yeah, almost $100 US to import a PS4 game form Asia, even if it is in English, is tough to justify. And yet we've yet to see (and most likely never will see) any incarnation of Transformers in Super Robot Wars. If they release it here as well in english, it'll be great. I'd read it. Optimus Prime drawn by Go Nagai. Skritz wrote: And yet we've yet to see (and most likely never will see) any incarnation of Transformers in Super Robot Wars. It's a Bandai game, Takara Tomy would never let it happen. Emerje wrote: Optimus Prime drawn by Go Nagai. Isn't the brave series one of those complicated matters as it was made prior to sunrise being bought by Namco Bandai? ZeroWolf wrote: Isn't the brave series one of those complicated matters as it was made prior to sunrise being bought by Namco Bandai? Did Floro Dery base Chromia's head on Diana A's? I always thought they looked too similar to be coincidence. Yup, but as it currently stands TakaraTomy has left anything relating to Brave to the stronger Bandai. The final nail in that coffin would be who handled the model kits: at first it was TakaraTomy-affiliated Kabaya, but now Bandai has released Super Mini-Pla kits for the GaoGaiGar series, in addition to the various Chogokin releases. I really need some of those kits. This has put a smile on my face, never I would beleive such crossover will ever happen, hope ther's going to be a translated version of the story. Well the nice thing about the SRW series for Ps4 is that they have had official English translations for Asian markets outside of Japan. The audio is still all in Japanese, but the script & writing is all in English, also since the PS4 is not region locked, they play perfectly on NA PS4. The only disadvantage is that DLC is not accessible unless you open an additional PS4 online account for a different region. But still, I have SRW V, and it is amazing. I am skipping X because it really didn't interest me, but T, which comes out in a couple months looks pretty cool. Admittedly, there will never be an official NA SRW release because licensing issues would be a nightmare (except for OG games which are occasionally released). But I figure, this *Asian Release* work around is the best way we will ever get English releases of these games. Just curious...other than some fan art by Matt Frank, when has there been any official Godzilla x Transformers media? I definitely want to go back and revisit that as seemingly I missed it. Motto: "I am the most dangerous!" I even checked TFwiki, and there is no mention of a Crossover with Godzilla. Alt Mode: Panzer IV Ausf. D tank. Well chalk that one down to my overactive imagination, I could have sworn it was a real thing but I've removed the text from the article, thanks for the correction. IDW initially wanted to include Godzilla in their Infestation crossovers, but Toho gave them a big fat NO. 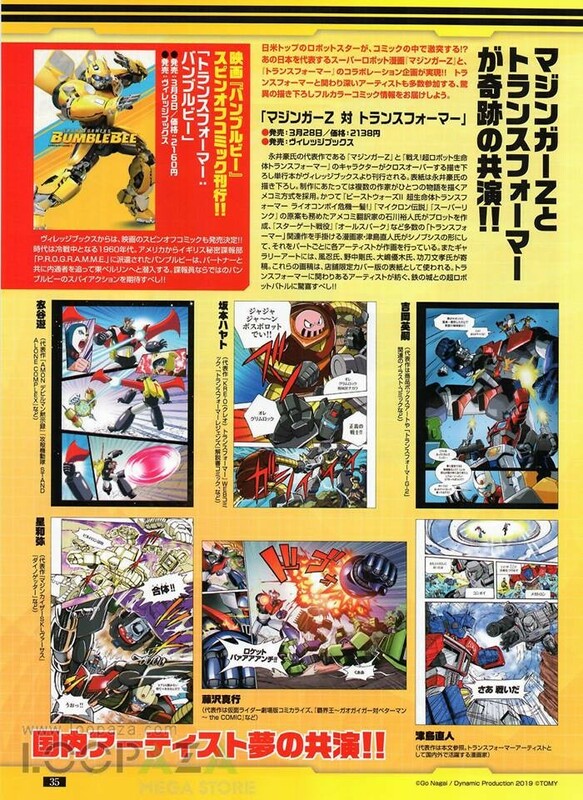 We first heard about Mazinger Z x Transformers crossover book only two weeks ago, but thanks to Figure King magazine we have our first look at some of the pages of the comic. A scan posted to Facebook by Loopaza Mega Store show off some of the fights including Grimlock versus Boss Borot and Mazinger Z grappling with Devastator! This is turning into the clash we never knew we wanted, but sure are glad we're getting! The book will be out in Japan on March 28 the price of 2,138 JPY ($19.30) and can be ordered on Amazon Japan. Thanks to Cyberpath for bringing this scan to our attention! Enjoy the preview and let us know what you think in the Energon Pub forums below.